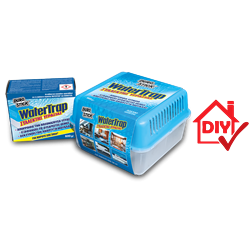 DUROSTICK WATERTRAP moisture collector is an easy to use device that absorbs moisture using special crystals. Reduces up to 40% of the excess moisture when placed in a closed off space. Its placement removes all unpleasant odors and does not favour mold, bacteria and microorganism growth. Its placement in inhabited spaces improves the air quality and prevents allergies, headaches and rheumatic pains by reducing the interior levels of humidity and/or moisture. It produces exceptional results when used in spaces that are not often aerated, such as storage areas and garages, lofts and attic spaces, indoor heated pools, vacation houses, motor homes, recreation boats and closets. Prevents moisture related damage to electronic equipment not used often, such as computers, sound systems etc. Use it to protect books and important documents as well as copper and brass items sensitive to moisture. Replacement bag of crystals 600gr.